An interesting thing happened in the world of Texas politics this week. It is pretty rare for a sitting Congressman to make an endorsement of a candidate for Congress in a contested race in the Republican Primary. In the race for CD14, candidate Felicia Harris has pulled off not one such endorsement, but two! I have been watching this race to replace the retiring Ron Paul in the US House of Representatives with some interest for several months. This announcement caught my attention and should cause you to take notice as well if you live in CD14. Harris has received the endorsement of Sugarland Congressman Pete Olson (CD22) and Waco Congressman Bill Flores (CD17). Olson serves in Congress on the House Committee on Energy and Power. Flores also has an energy background having served as CEO of Phoenix Exploration Company. Perhaps this explains their belief that Harris is not only the best candidate to represent the Republican Party in the November General Election, but also that they believe she is best suited to represent this energy rich district and will have the best chance of defeating twice defeated FORMER Congressman Nick Lampson. Congressman Olson is the most recent Republican to defeat Lampson, the other being Congressman Ted Poe (CD2). One can imagine he understands full well what it will take for Harris to be successful. "I was honored to have the support of people from across our area to oust Nick Lampson in 2008 - I know what it takes to beat him," said Congressman Olson. "Felicia's commitment to limited government principles, new American energy development, and a full repeal of Obamacare will give voters a clear choice in the general election - I guarantee she can beat Nick Lampson." 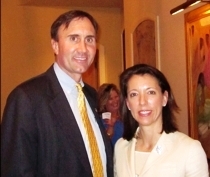 Congressman Flores also defeated an incumbant Democrat, Chet Edwards in the 2010 Repubican sweep to take back the house. Flores stated, "We need more people like Felicia Harris in Congress who will fight for limited government, balanced budgets and serious spending cuts in order to restore America's promise, prosperity and security for our children and grandchildren. I am also proud to endorse her as a fellow Texas Aggie." It is clear powerful supporters are lining up behind Harris in her campaign to replace the retiring Ron Paul. If you live in CD14, please take a serious look at her campaign. If you don't, perhaps you can find another way to support her to help keep this a Republican seat. 1) First I want to know who Ron Paul is supporting? Will he get involved? He is VERY popular down there pulling about 80% of the vote when faced with challengers. I think his endorsement would put either candidate in the driver's seat. 2) What gives Harris the edge over Weber in an energy rich district? Didn't Weber serve on the Environmental Regulation Committee in the Texas House and wasn't he appointed to the Texas Energy Council? And if I'm not mistaken, wasn't the STP Nuclear Power Plant (one of the largest nuclear power facilities in the nation) in Weber's House District? Seems to me that Weber is the only one with experience representing an energy rich district. Granted, Harris is an attorney who defended a power plant in a personal injury lawsuit, but I don't think that translates into writing governmental policy for them. And hasn't Weber operated a business that the EPA regulates? On this issue, it seems that Weber is head and shoulders above Harris. Advantage, Weber. 3) What gives Harris the best shot at defeating Lampson? Isn't this her first ever partisan race? Isn't Weber the one that has actually gone toe-to-toe with Democrats? But even more important is the ability to raise money. I checked the FEC and Weber out fund-raised Harris 3 to 1. The nominee needs to be able to match Lampson in fundraising. In my opinion, those two things alone give Weber the edge over Harris for the best shot at defeating Lampson. Throw in Weber's conservative voting record and Lampson will have his hands full against Weber. Best shot at beating Lampson? Advantage, Weber. 4) Weber's endorsements have come from Texas political figures, while Harris' endorsements have come from Washington DC political figures. Question - do you like the way they do things in Washington DC or in Texas? Advantage, Weber. 5) I have been told that Harris lives in Olson's Congressional District. Perhaps that is why Olson endorsed her? Two votes coming from the same District sure is nice. Wouldn't this further weaken Harris in a race against Lampson? I can already see him portraying her as a carpetbagger. Advantage, Weber. 6) Looking at the candidates objectively, I honestly can't see where Harris has an edge over Weber. Am I missing something? 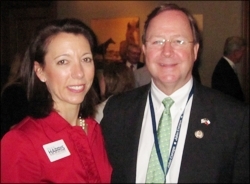 7) Finally, I noticed that the top blogger for texasgopvote, Cathie Adams, has endorsed Weber in this race. I value and respect her opinions. Does Olson know something she doesn't? I can't vote in CD 14, but my observations tell me Weber is clearly the best candidate to replace Dr. Paul.